This morning the Parable of the Sower took on a new meaning to me, especially in relation to thorns and weeds. Luke 8:1-15 has very important truths to share about our priorities in this life and what we are allowing to consume us. “This is the meaning of the parable: The seed is God’s word. Most people would agree that weeds and thorns are bad but really they are plants too. The problem is that they are misplaced plants - they don't belong in our garden space and they choke out our crops. This same concept can apply to the things in this world that distract us and steal our passion for God. Sin draws us away from God; we'll call it the "thorns" because sin is just a big 'ole pain. Now the weeds are the good things in our lives that Satan so sneakily manipulates into bad things. Even good things can turn into weeds that choke out our passion for God when they are misplaced in our lives. Problems begin when these good things start to consume our thoughts and our priorities. Just like the nasty weeds in our garden attempted to choke out this year's crop, the weeds and thorns in our lives will eventually start to choke out our relationship with God if left unattended. I'm passionate, motivated and focused in many areas of my life (aside from putting away laundry maybe) but this has also gotten me in trouble in the past. If my zeal is misdirected, I can end up running away from God instead of growing closer to him. God has blessed me with so many good things - my sweet family, the passion for running, a piano, and a heart for writing - but the key is to keep my priorities in line. When something sneaks it's way to the #1 seat in my heart, it becomes an idol. Relationships have attempted to steal that #1 seat, so has running, and even my old job! Thank God for His Holy Spirit that warns me when things are getting out of line and that guides me back to where I need to be. Keeping my priorities in line is a daily battle and that is yet another reason why I am also so thankful for God's patience and unconditional love for His children!. 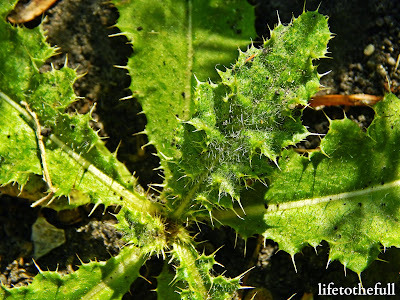 What worldly thorns and weeds are distracting you from God today? How do you keep yourself in check? Linking up at Friday Favorites and Mommy Moments. Dear God, please help me to plant my seeds in the good soil! I love this post, Amy...and I also like running! Running With Joy looks like a great book...I may have to check it out. How do I keep myself in check? Church ISN'T an option on Sundays, it is a must. Just as I have to practice running, I have to spend daily time practicing, and building up my faith (bible study). Having someone there to keep you accountable is so helpful, Cheryl! My husband helps me to remember that running is just something I do for fun - it doesn't determine my value or define me! Like you said, just as you practice running we need to train our faith, too! Mmm timely, I love your vulnerability with how you're so passionate it's distracted you from Him. Thank you for this I love reading your blog! I can't wait to check out the book you suggested. I am excited to have found you for that and the blessing that your reminder gives. I was thinking, though, that thorns are on a flowering plant, like roses, to protect. Sometimes in our lives the thorns we run into are a signpost to stop and look around us, see what is going on. Or the thorny people that rub me the wrong way, their thorns are a glaring sign that I need to be Jesus with skin on and allow them to maybe pierce me so that I can bleed grace?? You got me thinking today! So glad I could visit.